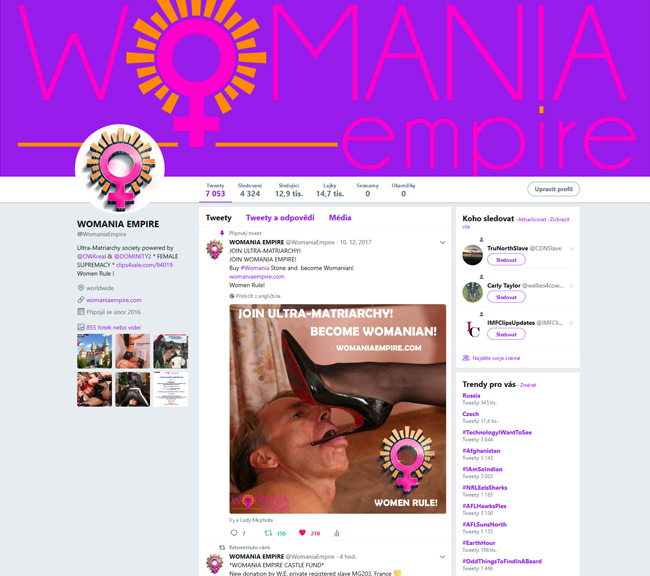 Support our fundraising for future Womania Castle too! EASTER SALE - OWK MOVIES FOR FREE! For every order over 25 USD one OWK movie or clip FREE! visits the OWK Castle for photo/filming on September 14 & 15,2018. On September 16 She will here judge & punish the offenders! More info about this first Womania Judgment Day will be released soon. There are still many Womanians who do not support our fundraising. Buying Womania Castle is our priority! We all want to live in a REAL ultra-matriarchal society! Send your Commitment to support too! Womana Empire need one or two subs for photo editing (easy work with photoshop) and / or for scan of slides. Must be trustworthy and own Womania Stone. received official Permission to masturbation. Women Rule, Control & Punish! Another gift for our future Womania Castle by sub gabi! Here is not any minimum limit - every dollar help us!